To define the correct cat allergy treatment, the first thing to do is of course to diagnose the cause of the allergy. 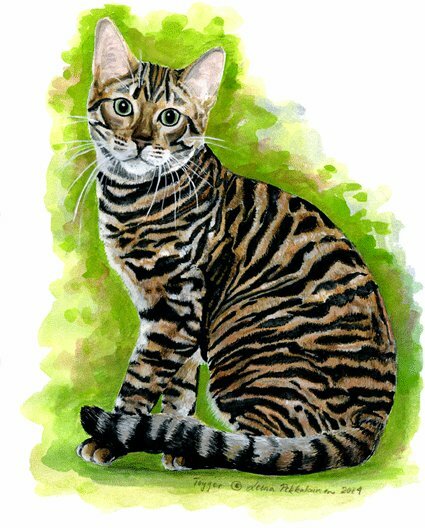 This Toyger painting can be found in Zazzle and Cafepress. 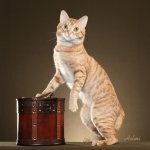 You can help the vet if you, even before going to the vet ,write down the cat’s medical history. 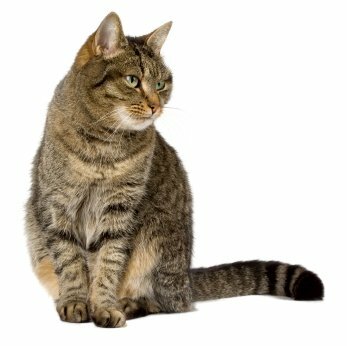 There might be a pattern of the itch that reveals the cause to the vet and cana help to determine the correct cat allergy treatment. Remember to mention if the cat’s allergy symptoms are contagious – has anyone else (cat or human) got the same symptoms. Intradermal skin test (dermal allergy testing) should be performed by a qualified veterinary dermatologist. These tests indetify specific antigens that are causing the cat’s allergy symptoms. A patch of fur is shaved off, and a small amount of the suspected antigen (antigen = the substance that triggers the allergic reaction) is injected under the cat’s skin. In deciding which allergens are injected under the skin the cat’s exposure to them is considered. The more likely a cat is exposed to the allergen, the more sense it makes to test them. The most common allergens tested are fabrics, insect parts, molds and pollens. Often the cause of the allergy is found among these, and the proper cat allergy treatment is quickly found. Usually sedation is used in intradermal skin testing, so you cat won’t suffer. The skin is re-examined after 48 hours, and if there is swelling and redness at the injection spot, it may be the allergen has been found. Or allergens in plural, as cats often react to many antigens. Blood tests are used to check the allergen levels of blood and they show if the cat has several allergies. Serum allergy tests are used to examine the serum of the cat’s blood (white blood cells and the fluid of blood, the red blood cells are excluded from this test). If there is a lot of immunoglobulin E, it tells that there are allergies and/or parasitic infections so the amount of immunoglobulin E levels against specific antigens are measured. (Immunoglobulin E is the antibody of the allergy) . The RAST or radioallergosorbent serum test identifies specific antigens causing the allergic reactions. Skin scraping is used to obtain skin cells. These are then analyzed to see the cause of allergic reactions. Skin scraping requires no anesthesia. Skin cytology is also used to check for infections and skin diseases. The samples are taken from the cat’s inflamed skin and pustules. Diet elimination is used when the cat has a food allergy. 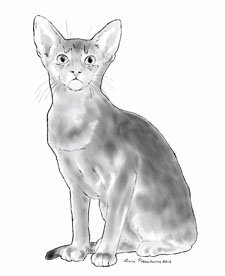 Black and White painting of an Abyssinian. 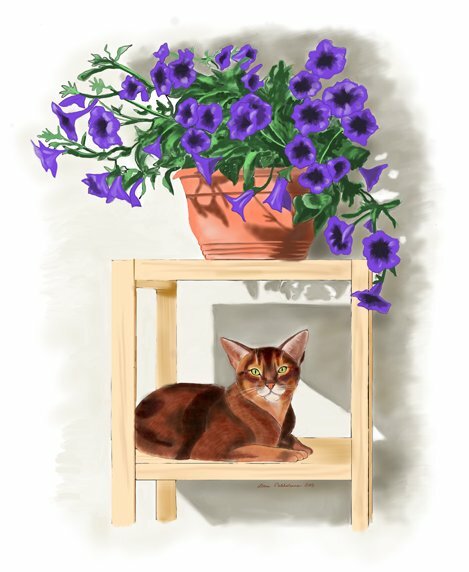 This Aby Painting can be found in Zazzle and Cafepress. Cat allergy treatment depends on the allergy in question. As it is not likely for a cat to be cured of its allergy, cat allergy treatment tries to reduce the symptoms instead. This is done by reducing exposure to the known allergen(s), and by boosting the cat’s own immune system. Sometimes the allergen cannot be determined, and so some prescription medication – oral or injected - may be used as cat allergy treatment to suppress the symptoms. But first one thing has to be emphasized. NEVER give your cat human medication as cat allergy treatment. Some of the most common medications we take without second thought can be downright deadly to a cat. For example Aspirin is toxic to cats. Medications like acetaminophen, benzocaine, ibuprofen and paracetamol should never be given to a cat. Also if your cat has secondary symptoms, these should be treated first to see if the actual allergy treatments have effect. The main cat allergy treatment in contact allergies is prevention of exposure to the allergen. The obvious cat allergy treatment in food allergies is removing the food that causes the allergy from the cat’s diet. Inhalant allergies are caused by environmental antigens and the treatment is a bit more complex. It is impossible to completely eliminate exposure to these antigens. Still there are easy ways to limit the antigens entry to your home. Keep the windows closed if the antigens come from outside. Also use an air filter / cleaner in your home. (People also benefit from the cleaner air, not just the cat.) Clean your shoes when you come in, and if any animals in the family go outside (like dogs), clean their paws before letting them back in. Changing the cat litter to a non-scented one may bring surprising relief. 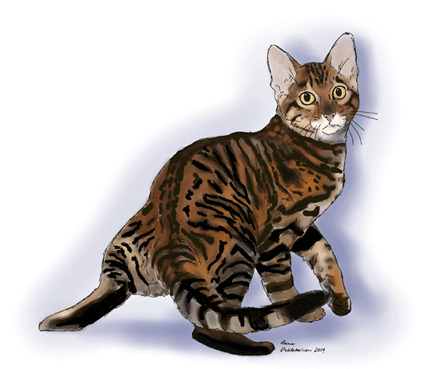 Cat allergy treatment for inhalant allergies are often antihistamines. Remember to rotate these; change to a different antihistamin after three months, as this is the time span a cat can build immunity to the treatment. Decongestants are also used to ease the symptoms of inhalant allergies. Skin allergies are treated with corticosteroids and immunosuppressive drugs. The first steroid injection should bring relief to your cat within a day. It should relieve the itchiness for a month, and after that oral steroids are given, according to the vet’s advice. If the skin reactions are caused by parasites, the parasites should be treated first. Insecticides can be used, as well as a flea collar and special shampoo. This Design can be found in Zazzle and Cafepress. These immunotherapy or desensitization shots are used in inhalant allergies to gradually desensitize the cat to specific allergens. The serum injected to the cat is a specifically made mixture of those proteins the cat is allergic to. Each cat gets its individual serum, which is fitted to its needs. Of course this requires that the specific allergen has been found first or the shots cannot be manufactured for the cat. Allergy shots are used in small amounts and they are diluted with serum so they won’t cause too much discomfort to the cat. They are injected under the cat’s skin. The treatment consists of a series of these injections. In time the amount of the diluting serum decreases and the allergen increases as the cat’s tolerance to it increases. This is achieved by stimulating the cat’s immune system, which basically causes inflammation in the cat’s body. In the beginning stages the cat may suffer from a rash or swelling of the injected spot, and some joint or muscle pain, but these symptoms should decrease with time. They should not be dangerous to your cat, but if you feel the cat is feeling worse than it should, contact your vet. Symptoms that should immediately make you phone your vet are facial swelling, hives and nausea. Sometimes these shots may cause some nausea and vomiting, which may continue for some months even, but always check with your vet if this happens. In very rare cases allergy shots as cat allergy treatment may cause an anaphylactic shock in a cat, which may even cause death, but this is rare in cats. They seem to take the treatment a lot better than dogs. At the start the cat needs to have the allergy shots every week. After a while these desensitization shots can be given bi-monthly. After a while the shots are given once a month, and finally at the interval of three to six months (with more concentrated injections). You can learn to give these injections yourself. It may take weeks, even months (even up to two years) for the allergy shot treatment to work, so this is not a quick treatment. While waiting for the allergy shots to do their work, other treatments should be used to ease the cat’s discomfort. The treatment is often expensive, but the cats respond to this cat allergy treatment pretty well. Over 70% of the cats respond positively to the treatment, and maybe 5% heal from their allergy (this has been known to happen after 4-5 years of allergy shots). Also allergy shots cannot be used in cases of food or contact allergies. Steroids (corticosteroids) are used as shots, orally and as topical ointments. They greatly help to reduce itchiness, rashes and swelling in severe allergies. Usually they are not used lightly because of their possible side effects. The topical ointments help the itching skin. Oral steroids have a general calming effect over the cat’s whole body. Shots are usually a quick method to bring initial relief to the cat – for example is the cat has a seasonal allergy, like pollens in the spring, one steroid shot may be all that is required to cure the symptoms before the next allergy season begins. Long term use of steroids may have serious side effects – cardiovascular problems and kidney disease being some of them. They can also increase the cat’s appetite, cause acne, hormonal imbalance and behavioral changes. Still, steroids tend to have fewer side effects in cats than they do in people. Steroids can be used together with antihistamines. Antibiotic creams are used for bumps filled with puss. Cool water baths can help your cat’s allergy symptoms. This is so because allergens may access the cat through skin pores, and keeping the coat and skin clean reduces these allergens. If the cat is very allergic, even weekly baths are recommended. Hypoallergenic shampoos and soaps help in allergies too. There are different kinds so check from your vet again. Oatmeal and aloe vera in shampoos tend to have calming effects on the skin. Antihistamins are synthetic chemicals that inhibit histamine release in a cat’s body. This eases itching of the skin. They are an effective cat allergy treatment when dealing with allergy reactions caused by the cat’s own immune system. The idea of the antihistamines is that they inhibit the immune system, as compared to most medicine which is geared towards strengthening the immune system. Antihistamines can be used alone, but better results come when they are used in combination with other treatments (like fatty acids and biotin). They do not help if the disease is caused by pathogens. 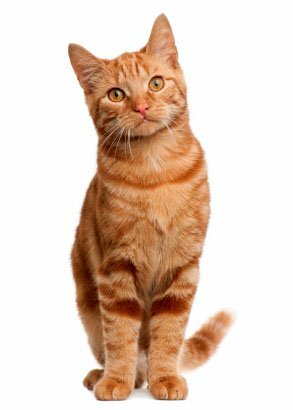 A cat usually develops immunity to antihistamines after three months, so they need to be changed to another brand every three months. The side effects of antihistamines are agitation, confusion and dizziness, dry mouth, headache, lack of appetite, loss of energy or the other extreme i.e. hyperactivity. Also nausea, tummy problems (diarrhea or constipation), urinating difficulties may occur. However, if the antihistamines are dosaged correctly, these side effects are not likely to appear. In constant use the antihistamines may affect the cat’s vision and make them more irritable. So, just like steroids, they are recommended for short time use only. When using antihistamines, get a prescription antihistamine – over the counter ones are not as effective. Also prescription antihistamines are less likely to make your cat tired. Topical treatments such as shampoos, soaps and ointments usually give great relief to a cat, but in long term use these too can have serious side effects. There are holistic treatments available for cast as well. But if you choose to use herbal or other natural treatments, check if they go well with the medication your cat is taking. Also remember that not all herbs are beneficial to cats. Follow the instructions carefully. Also do not make your own remedies. Natural treatments were developed as conventional medicine is all about suppressing the symptoms which easily leads to an endless cycle of antibiotics and steroid use. Natural treatments try to approach the healing from a different angle. For example to replace steroid topical ointments, some good natural ointments are in the market too. Diet supplements such as Omega 3 fatty acids (fish oil) are one very popular allergy treatment. They should normally be a part of the cat’s diet. Lack of these fatty acids causes the cat to have a dull greasy coat, dry skin and poor immunity level. Omega 3 fatty acids reduce the overreacting of the immune system to antigens. They boost the immune system even to the extent of cure in some cats. On the other end they don’t seem to have any effect in some cats. But in any case this is a long-term treatment. They are not to be used as a sole remedy. And remember – it is Omega 3 that is beneficial. Do not give fatty acids, like Omega 6, at random as these may actually worsen the allergy. Other good dietary supplements are fkaxeed oil and antioxidants. Biotin (a B-vitamin) is also quite effective when used together with fatty acid supplements. You can sprinkle it as powder on your cat’s food. Vitamins A and E also help the skin gain its balance. Yucca is anti-inflammatory and should reduce and prevent allergy symptoms. Also Echinacea and licorice root are natural remedies that should strengthen the cat’s immunity system. There are also homeopathic remedies to cats. But which ever form of treatment is best for your cat, they are likely to be costly (we are talking hundreds of dollars at least), so a cat insurance would be a wise thing to have. Here is general info about feline allergies.